Latest VPN shows continuing challenges for car makers and dealers. The latest TransUnion Africa Vehicle Pricing Index has been released, and the new report highlights the role of the constrained economy, a VAT hike, and petrol price increases, in pushing VPI below inflation for the 6th consecutive quarter, although the outlook for 2019 is looking more positive. According to TransUnion, new and used vehicle prices showed an annual increase of 2.5% and 1.6% respectively in Q4 of 2018. There was a small increase in the rate of growth for new vehicles, which had an annual rate of price inflation of 2.4% a year earlier (Q4 2017), but was a marked decrease in the rate of price inflation for used vehicles which stood 3.5% in Q4 2017. This was, however, lower than consumer price inflation over the same period, which ended on 4.5% in December and followed a high of 5.2% in November 2018. 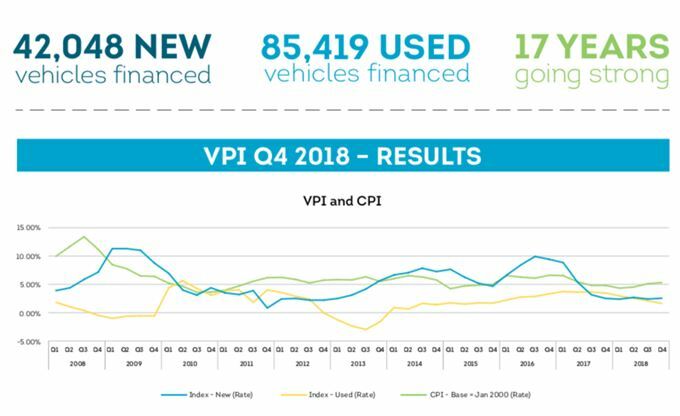 T VPI also revealed that new and used passenger vehicle finance deals decreased year-on-year by 7% and 15% respectively, while the used-to-new ratio decreased from 2.22 in Q4 2017 to 2.03 in Q4 2018. Total financial agreement volumes in the passenger vehicle market also decreased by 12% between Q4 2018 and Q4 2017. Commenting on the results, Kriben Reddy, Head of TransUnion Auto in Africa, said: “Challenging economic conditions have seen manufacturers reduce the price of new vehicles in real terms as a way of stimulating sales. It is important to consider the overall cost of owning a vehicle not just the purchase price. Factors such as household disposable income and consumer confidence are also part of the changing dynamics of the vehicle market." The latest consumer confidence data* released in January held steady after a substantial deterioration in confidence levels across all income groups were recorded in November 2018. Reddy confirms that low consumer confidence levels have a direct impact on whether a consumer will consider entering into the buying cycle or wait for conditions to improve: “Even when the consumer decides to proceed with a purchase, it is often at a lower price point, which places pressure on manufacturers and dealers and erodes their profit margins." According to the latest TransUnion Africa Vehicle Price Index report, the percentage of new and used vehicles being financed below R200 000 now stands at 37% – marginally up from last quarter’s 36% – and mostly consist of used cars. "Thirty-nine percent of used vehicle sales during the period were for cars that were less than two years old, while 10% were for demo models. In the South African market, there is a significant price differential between new and used vehicles, so demo models and used vehicles less than two years old offer attractive alternatives to purchasing a new vehicle – especially as the baseline price of new vehicles now sits at the R200 000 to R300 000 band," adds Reddy. The latest figures from NAAMSA** showed total new vehicle sales had declined by 1% year-on-year, although export sales have consistently recorded growth. The automotive industry is a substantial driver of the country's economy and contributes 7.7% to South Africa's annual GDP.